We had an OK day at Churchill Downs on Saturday, posting 4 wins in the 11 race card. We did hit for five exactas, as well, but most of them were small. The best were $11.90 and $11.80 for each $1 wagered. The sad thing was that Ed DeRosa and I teamed up for a nice try at the Pick 5, but we missed the Iroquois. We went 6 deep in that race, too, and still couldn’t catch the long shot. Our 7th horse on the list was the eventual winner. One more horse. Oh well. We are back and what a gorgeous day. Leigh Ann and I went to the track on Saturday and enjoyed a wonderful day in the sun. We baked a little bit. But we had a blast, too. Hope you can get out today. It should be another glorious one. 1st: 4-2/6-5/3-7-1…I will focus on the top two numbers here, led by Hymn to Inanna (4). This filly is moving up a bit in the claiming ranks in two ways. She lost her “two lifetime win” condition with her second win in a row last out, and now she will try higher-priced horses, as well. That makes this one a bit more vulnerable than normal, as she fights against tougher — arguably. But…She is doing so well right now that I will ride the tide. Gets Corey Lanerie back in the saddle. As you know, he is the go-to guy in these parts. Pearl’s Opinion (2) is definitely the horse to beat, and could be really tough in this spot. She is dropping down in class, after trying Stakes company and the turf last time out. Trained by Tom Amoss, who is off to a great meet — especially considering that his star 2YO filly Serengeti Empress ran off to a near 20-length win in the Pocahontas on Saturday. This one broke the maiden here in early May. This is second off the layup, and the barn hits with .32% when switching from grass to dirt. Like the odds better here. I bet the 2 (Take Note) across the board and then box the 4-2 in the exacta. I key the 4-2 over/under the 6-5 in a smaller version. 2nd: 1-2/11-10-6-9-5/3-4-7…Again, I will focus on the top two numbers here, led by the railbird Mister Harvey (1). This one come from the barn of Brad Cox, who is sure to heat up here before long. This one flashed a lot of speed in the last out at Ellis Park before spitting the bit. Now, drops into the claiming ranks; gets the blinkers for the first time; and runs as a gelding for the first time. Wow. Lots of equipment changes here. 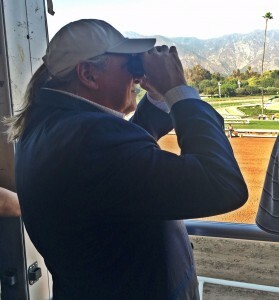 Trainer hits with .25% of those dropping into the MCL ranks; wins with .20% getting the blinkers; and the rail last meet yielded .20% winners. Adds up for me. Sambucca (2) is another who showed speed at a MSW level before wilting late. Now, he drops into the MCL ranks for the first time and the trainer hits with .33% of those doing that. That’s out of 24 runners this year. This one was bet hard in the debut run, and the runner-up in that one has already come back to win. I bet the 1 to win/place/show and then box the 1-2 in the exacta. I key the 1-2 over (only) the second group of numbers in a smaller version. 3rd: 3-2/5-1-6…For the third race in a row, I will concentrate on the top 2 numbers. Maybe Wicked (3) comes from the Cox barn and won easily the last time out when making all the run from get to go as the post time favorite. Now, she will try to win two in a row and her third race in the last 4. Trainer hits with .29% of those looking to repeat a trip to the winner’s circle. Nice works here on Sept. 9 and Sept. 1. Looks solid. She’s a Gypsy (2) will be making her second start off a layoff, and the trainer hits with only .09% of those, and she’s had 32 runners fit that category this year. But…She is coming off two straight wins, too, and looks to be a nice one for the barn. Love the work here on Sept. 9. She could be a handful to hold off late. And, take note: this track right now is playing heavy to closers. Heavy. I bet the 3-2 across the board and then box those two solidly in the exacta. I key the 3-2 over the next group in a smaller version. 4th: 9-1/6-2/11-12-4/7-3-5…The top two numbers in this sequence stand out to me. I will lean towards Systemic Risk (9), who will be making her first start of her career. This barn hits with .15% of those debuting in the MCL ranks, and with .24% of those running for a tag overall. This Into Mischief filly may be worth the asking price, too. The sire is so red hot that it is hard to imagine that she will not be claimed today. And, the works are solid, too. Gets Corey Lanerie up and that should make this one competitive. Que Sera Sera (1) nearly won her career debut before tiring late to finish second to what could be a good one. Now, this daughter of blame drops into the claiming ranks for the first time. Had a bullet work over at the training center on Sept. 12. Hope that does not take too much gas out of this fireball. Worth a claim risk here, too, being a daughter of Blame and out of a Stakes Placed mare. I bet the 1 (Take Note) to win/place/show and then box the top 2 solidly in the exacta. I key the top 2 over/under the next two in a smaller version. 5th: 6-8/3/9-5-11-2…Top two numbers here get my focus. Tonbo (6) is a 5YO gelded son of Awesome Again who has found a nice home running at the basement price of $5,000. Has won two in a row since moving back to the dirt for a nice, young trainer. Ran away with both of those efforts at Ellis Park with Lanerie in the saddle. Now, he jumps off and the barn picks up Ricardo Santana, Jr. Interesting move by the Lanerie team, but this guy can really ride, too, and has had a really nice summer. Union Bowman (8) is the 8-5 ML favorite and picks up the services of Lanerie. He rode this one to a huge win here at this level back in June, and this one has gone on to win two of the last three at Indy Grand and Belterra. Now, he hooks up with Lanerie again. This one is 11YOs. Wow. And, rolling. I bet the 6 across the board and then box the 6-8 in the exacta. I key the 6-8 over/under the 3 in a smaller version. 6th: 6-9-1/5-10-7/2-3-4…I think I need to spread out a bit more in this tilt. Dance Rhythms (6) has won two of the last three and has been really steady most of his year with a 3-1-1 record in 9 starts. Lanerie takes another mount, but this rider is off to a good start here this meet and this one fired a nice bullet move before the last win at Ellis Park. Now moves from the turf back to the dirt for a trainer that hits with .11% of those making the surface move. Good right now. Racey Reecey (9) goes for the barn of Bernie Flint, who likes to crank them up and let them roll. This one is a speedball that fits that category. Although there seems to be a track bias right now against the front end speed, this one is moving back to dirt where she really excels. Trainer scores with .25% of those moving from the sod to the sand. And, this one has a win and a third at this distance, and a 2-2-0 record in 7 tries here. Beware at a nice price. Compose (1) is an interesting one. This is a 7YO mare owned by Maggi Moss, but trained by Steve Asmussen. Most of her horses here are over in the Tom Amoss barn. But this team claimed her back in late January. Since then, they have got a win and two seconds in six tries Likes to motor on the front end, as well, but loves it here. Has a 2-2-0 record in five races over this track. I bet the 6-1 across the board and then box the top 3 in one exacta. I key the top 3 over the 5-10 in another. 7th: 5-1/9-3-10-7-11/4…The top two stand out for me, but I will stretch a bit and include a third horse in most of my plays here. Covfefe (5) is a first time starter from the barn of Brad Cox, and she has been working lights out at Churchill Downs for quite some time. Trainer hits with .22% of those making the career debut, and he puts up one of his top riders in the irons here. This rider has won .40% of his last 42 rides for the barn. Daughter of Into Mischief was purchased for $250,000 at last year’s Keeneland September Sale. May be fun to watch this one. Super Simple (1) comes from the Asmussen barn and she has more experience, for sure. This will be her 5th career start. I can toss the last one, which was a try over a good turf course. Now, back to the dirt where she has a win already — but was DQ’d in the late going. That is normally a key. Bourbon Girl (9) is worth a stretch to include for me. This gal can motor. Believe me. And, she showed it on debut before tiring late after a tough speed duel. If the jock can save a little of that gas for later, she may be a tough out at some nice odds. My Upset Special — at least to hit the board — in a tough one. I bet the 5-9 across the board and then box the top 3 numbers in the exacta. 8th: 10-11/9-2-3/67-8-1…I will focus on the top two in this grouping, as well. Unholy Alliance (10) is another first timer from the Cox barn, and this one cost $170,000 at Keeneland last September. That was the 6th highest price paid for a First Samaurai at that sale. She is working well for this one, too, and we all know about Cox and Shaun Bridgmohan. Lights out. Istan Council (11) has a wide post, too, but she is working so well it is impossible to ignore. Trainer is off to a good start here, and nearly won a Stakes on Saturday. Trainer hits with .20% of those making the debut in the MSW ranks. I bet the 10 across the board and then box the top 2 in the exacta. I key the top two numbers over/under the 9-2-3 in two smaller versions. 9th: 2-1/4-8-3/7-5…Fort Peck (2) is my Best Bet of the Day. This 3YO gelded son of Fort Larned got off to a really good start this Spring and ran a huge second to Mr. Freeze in a MSW event at Keeneland in April. That one has gone on to become a force in some nice 3YO Stakes / Derbies around the country. Broke his maiden here for fun in May, and then fell apart a little bit. Got the glasses last time out and looked like it helped. Trainer hits with .26% of those returning as a beaten favorite. Interesting rider choice here. Don’t see Lanerie riding for this barn much, but he gets his second trip in a row with this one. Watch out here. Bryzzo (1) is a high-priced son of Medaglia d’Oro and he is a monster in the mornings. Has not been able to show the same in the afternoons much, but he moves back to the dirt today after a OK run on the grass down at Ellis Park. Trainer hits with .21% of those making this surface switch, and I look for a lot better at a really nice price today. Longshot Special. I bet the 2 to win/place/show and then box the 2-1 in the exacta. I key the 2-1 over the next three numbers in my allotment. 10th: 1-9-10/6-7-11-8/2-4…Today’s finale appears to be a bit more wide open, and I spread out just a tad more. El Cucuy (1) draws the rail and will make his first start for the new barn after he was claimed for $20,000 at Saratoga. Let me just say. This could be an expert purchase at this price. And, it could all start right here today. Son of Ghostzapper looks to have some ability after a second and a third in the first two tries. Moves up a notch in price, but looks to be OK in this spot. National Pride (9) is another who was claimed last time out for $20,000. This son of Distorted Humor was taken off Asmussen by a top claiming trainer — who hits with .17% of those making the first start for the barn. Nice training session on Sept. 6. Nice. Cat’s American Pie (10) could add some spice to the plays here. Ran a really nice closing fourth over the grass at Ellis in the debut. Trainer does OK (.14%) with the first drop into the MCL ranks, and love the works here before the grass run. Could be a surprise. I bet the 1 across the board and then box the top 3 numbers in the exacta.